Spectacular sunset on the Hudson this evening. Reminded me to remind you that the sale in my Etsy shop ends tonight. Just added a few more ornament samplers. I have a few more images to share from the workshop. Just for fun. Sitting with Mary in her studio office, I discovered this shadow box she made after my last class - using Cherie's tiny paper banner. And Amy's hat and class creation sit by Mary's desk phone. Under glass! Kathy's vintage stash shared so generously. Another shot of Miss Annabelle. Mary's sister, Alexa collects elephants. Guessing that Mary painted these plates. The pillow I made for Mary in 1984. Her collection of the books we did together. An embellished portrait in Alexa's office. The walk from the studio to my dear friend Nicki's for dinner. My old neighborhood. Still love it so. Have a great weekend being inspired by your world - wherever it is. It's good to be home again, surrounded by my busy family. Looking past the stacks of things to do and put away, I jumped in and finished up a new sampler design. For me and then for you! And ... don't forget to comment on the previous post to be included in Mary's book giveaway. Comments close Sunday night. We really had such a wonderful time. The second day brought a few new students and a fresh set of classes to the studio. As before, the excitement of being in the studio with Mary generates a special buzz (possibly stoked by the neighborhood Starbucks a few steps away)! Mary and Barbara welcomed everyone so warmly. For me, it's always like coming home. My Sunday class was Old-fashioned Ornaments. Lots of loveliness! We cut up my upcycled felt stash and made some little mitten ornaments. Kathy's class made stunning paper wreaths. Nancy's class made beautiful holiday tag books. Everyone enjoyed the day so much. I thought it was especally sweet that several students used the event as a girlfriends' getaway reunion. It felt like that for me too. Having the chance to weekend with my old friends was so great. 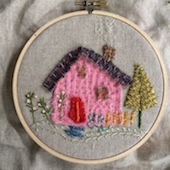 Mary brought out her stitched version of my little house sampler. So darling! I left her with a few new designs to try out. She signed a copy of her beautiful new book - as a gift for one of you! It's amazingly beautiful, so richly illustrated with the magic of her style, Christmas, sugar plums and fairies galore. If you'd like a chance to win this signed copy of the Nutcracker, please leave a comment on this post and a winner will be drawn Sunday night. Thank you, Mary and Barbara, the studio staff and all the wonderful students! What fun! We had an over-the-top inspired weekend crafting inside Mary's enchanted studio in Saint Louis. On any day the place itself is so cozy and inviting. But with holiday decorations, it's like stepping into one of her drawings. I was a little swept away by the photo vignettes. And then the work that the students created was just beautiful. Everyone was deliriously happy inside her wonderland. Here's a look at the first day. I taught my holiday sweater class, Kathy shared her needle-felted scarves and Nancy led a Christmas journal class. Barbara set up a souvenir photo booth and Mary signed The Nutcracker and other pieces for each attendee. Busy, busy elves indeed! Little Annabel stopped by to collect her mom at day's end and modeled her new sweater for us. We all went a little ga-ga over her cuteness. Understandably so. She also had my favorite quote of the weekend. When asked if she knew who Mary was, she said Oh, yes! That's Mary Email-bright! I so wanted to take Kathy's scarf class. And Nancy's layered journal class. Too much for one post. Do come back tomorrow for Sunday's class pics - and a very special give-away!